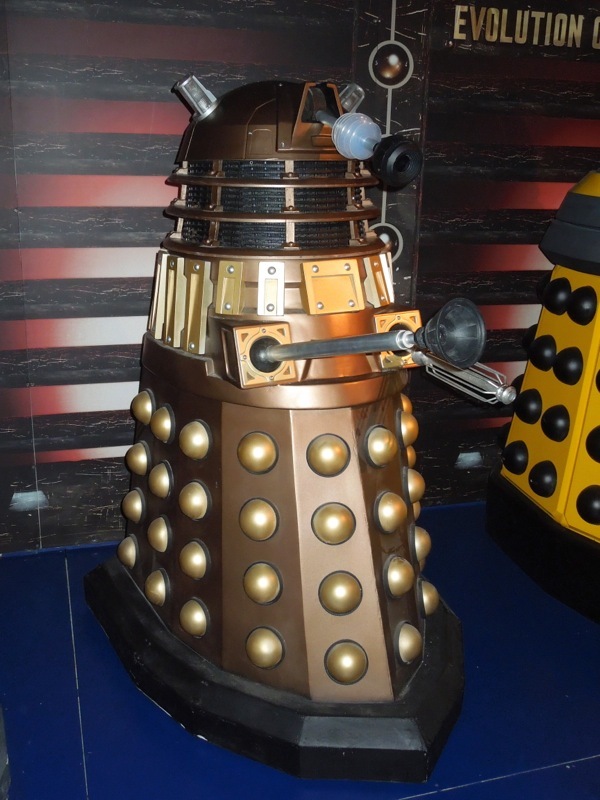 When I was growing up and watching Doctor Who on TV, I really was one of those kids who'd have nightmares about those metallic menaces, the Daleks, as they came to exterminate me. 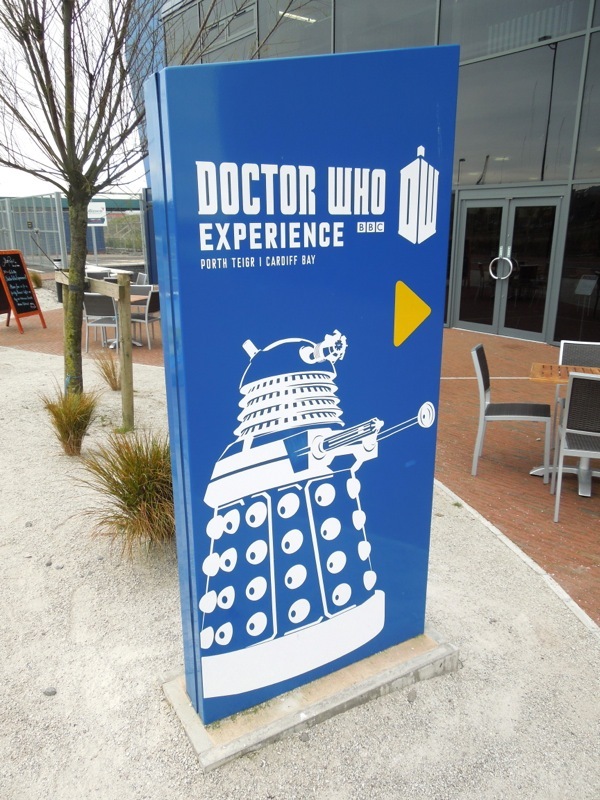 However seeing 'Davros' and all these variations of his instantly recognisable creations at the Doctor Who Experience in Cardiff Bay on May 20, 2103, was really a dream come true and I was in fanboy heaven. 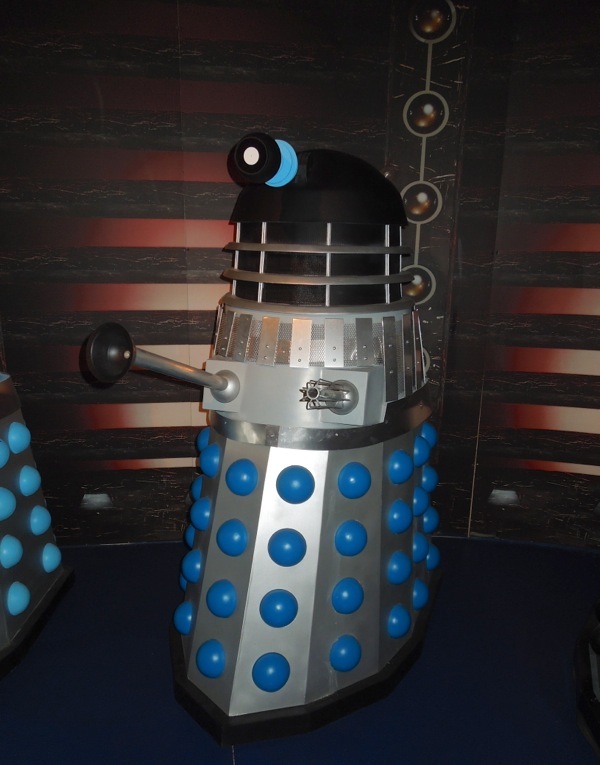 The Daleks really have become a modern day pop icon and everyone recognises their familiar design, even if they don't watch Doctor Who. 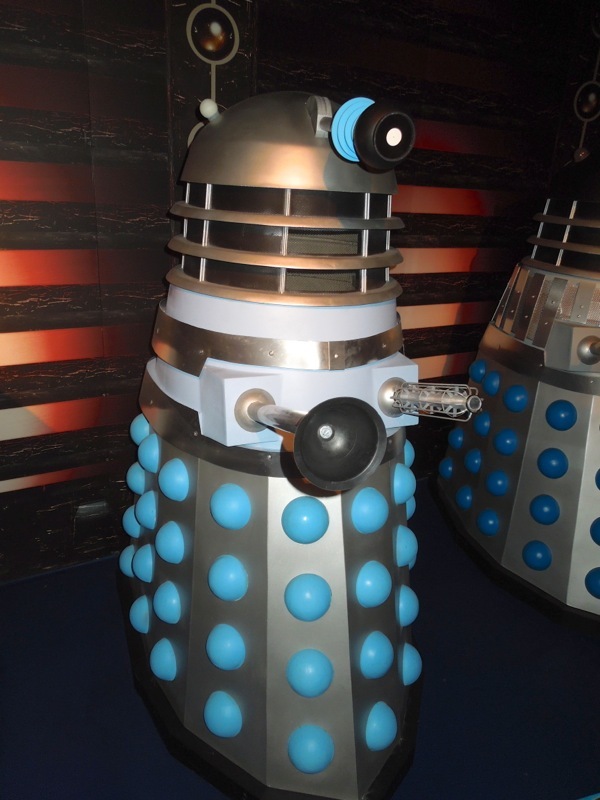 Even though they look like robots, these merciless arch-foes of the Doctor are a race of cyborg aliens from the planet 'Skaro'. The genetically-altered mutant 'Kaled' race have been integrated into the tank-like mechanical shells covered with hemispherical bumps. 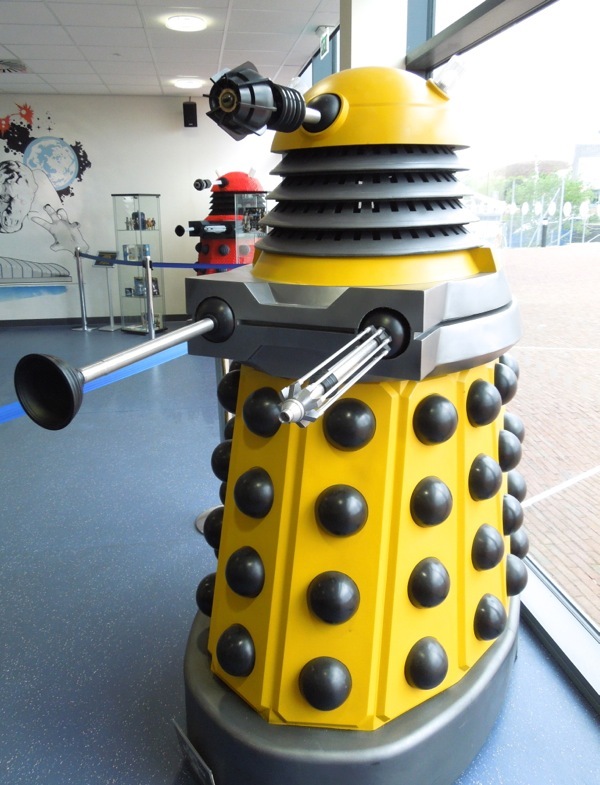 Other distinctive features include their rotating dome heads with their now iconic cyclopean eyestalk, their telescopic sink plunger-like arms, coupled with an opposing mounted death ray weapon. 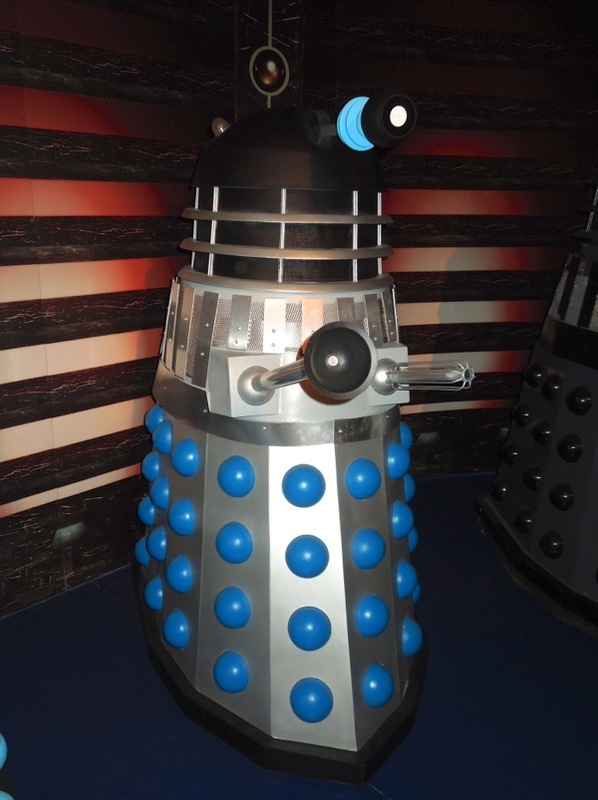 This is a replica of the first type of Dalek that made its debut on British television screens in December 1963, gliding across the floor in the First Doctor serial, The Daleks. 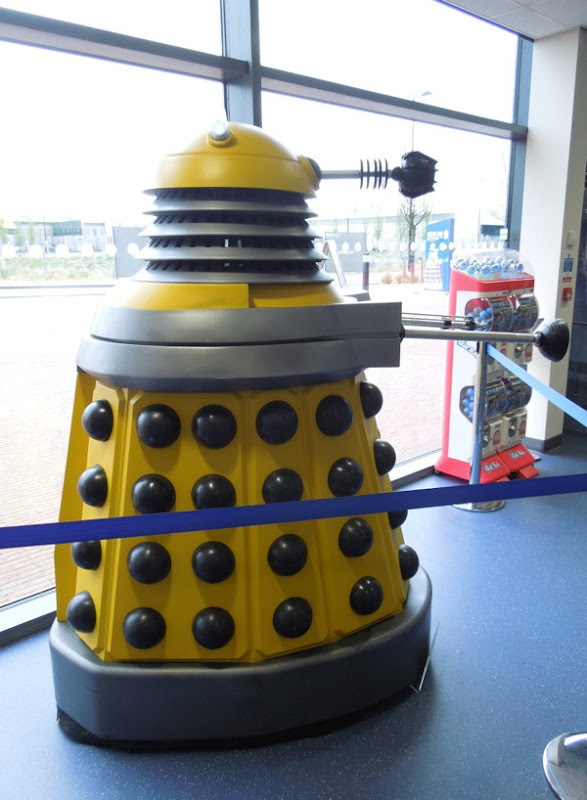 They were created for TV by science-fiction writer Terry Nation (who also negotiated a nice co-ownership deal), who wanted a creature that looked totally alien with no human features, and BBC designer Raymond P. Cusick. 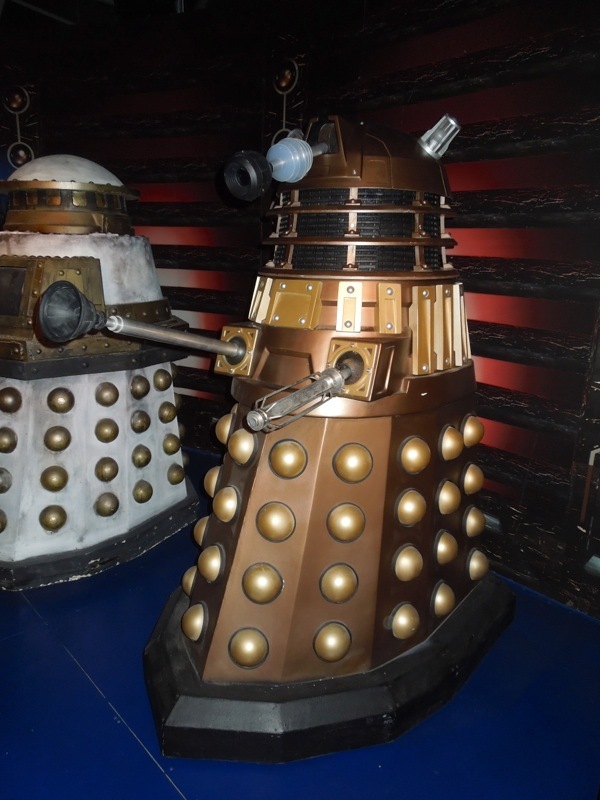 The Doctor first encountered the Daleks on the planet Skaro, but he soon ran afoul of them across the universe, including in the 1967 story The Evil of the Daleks, when they traveled to Earth to capture him. 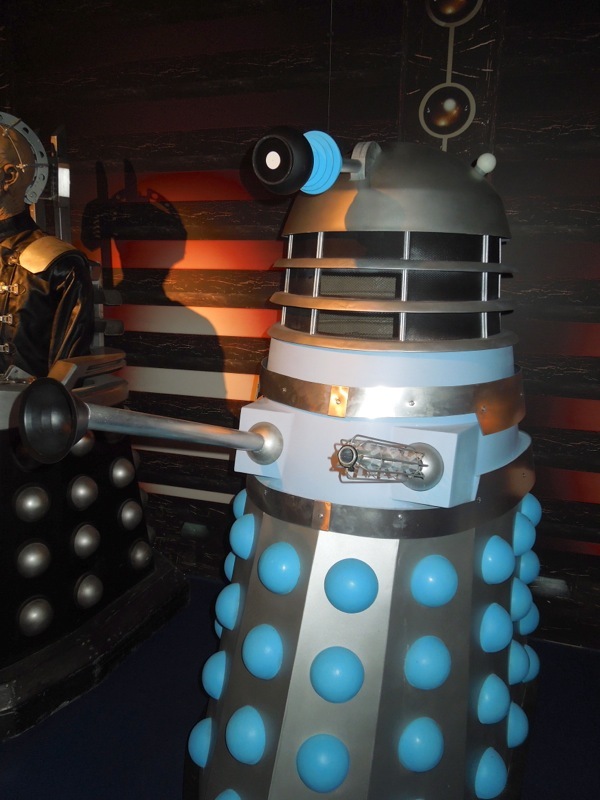 The Second Doctor met this black-domed elite Dalek commander in the Dalek City on Skaro, before he helped spark a civil war amongst his deadly enemies. 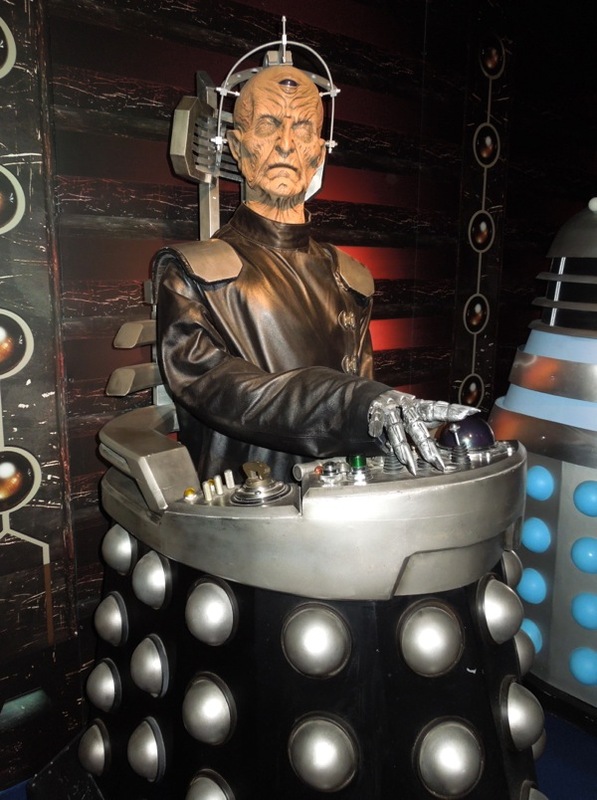 In the show, the actual creator of the Daleks was revealed to be the ruthless Kaled scientist 'Davros' in 1975's Genesis of the Daleks, which starred Tom Baker's Fourth Doctor. 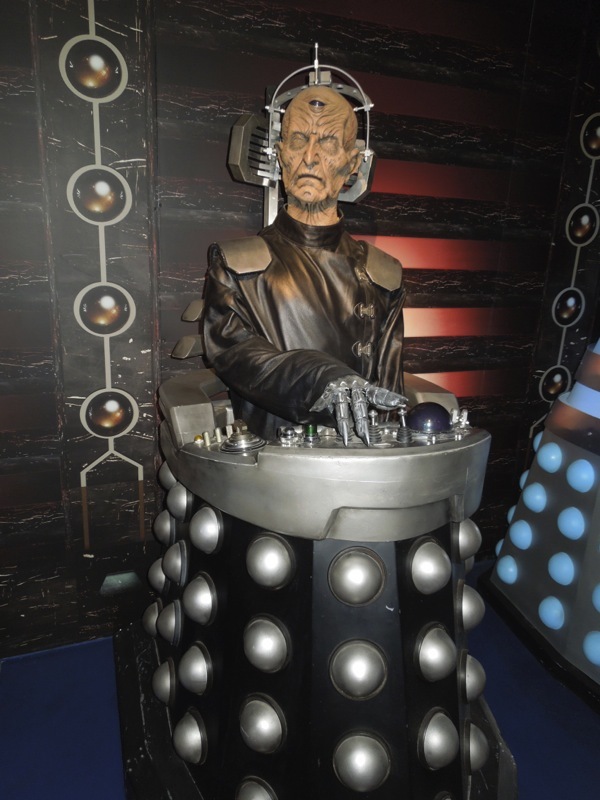 During the seemingly endless war with the 'Thals' on his native Skaro, Davros was horribly scarred and crippled, requiring him to build a mobile life-support machine, which obviously became his inspiration for the armoured, death-dealing Daleks. 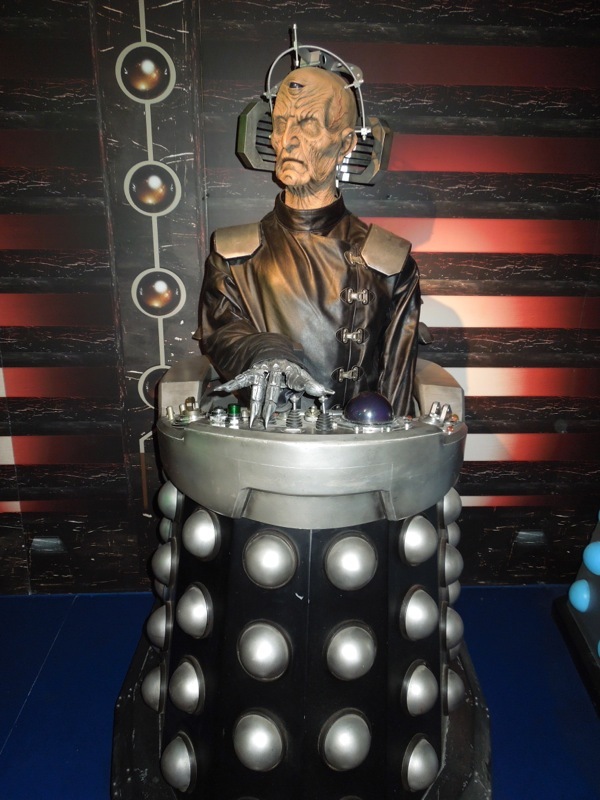 Davros has been portrayed in the series by several actors including his first appearance played by Michael Wisher (1975), plus David Gooderson (1979), Terry Molloy (1984-1988) and most recently Julian Bleach (2008). 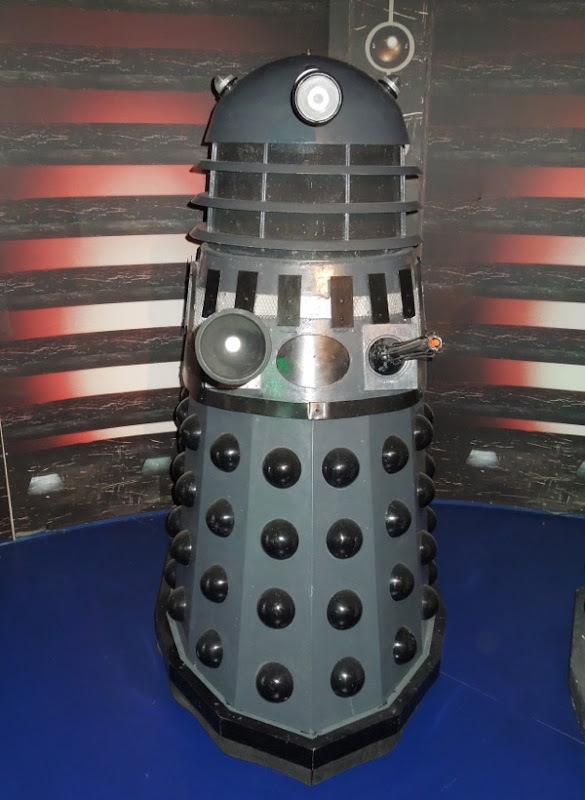 This next Dalek is a refurbished original prop and this design was seen in many stories in the 1970's and 1980's under the command of Davros. 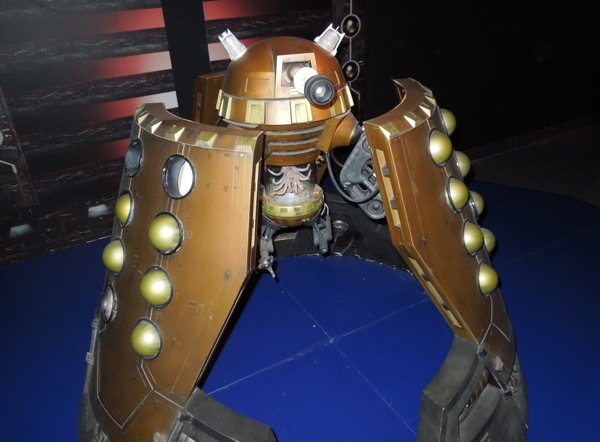 This particular specimen was seen in 1984's Resurrection of the Daleks, which featured Peter Davison's Fifth Doctor, battling the Time Lord on their spaceship and in London's deserted docklands. 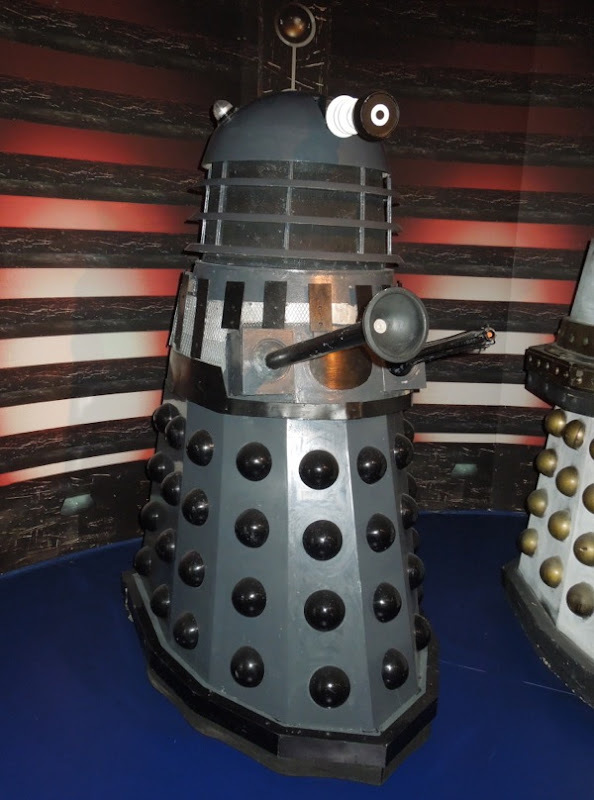 Continuing to evolve over time, even without the assistance of their creator, this model of Dalek with its uncharacteristic single appendage, a powerful disintegrator cannon, featured in the 1988 serial, Remembrance of the Daleks. 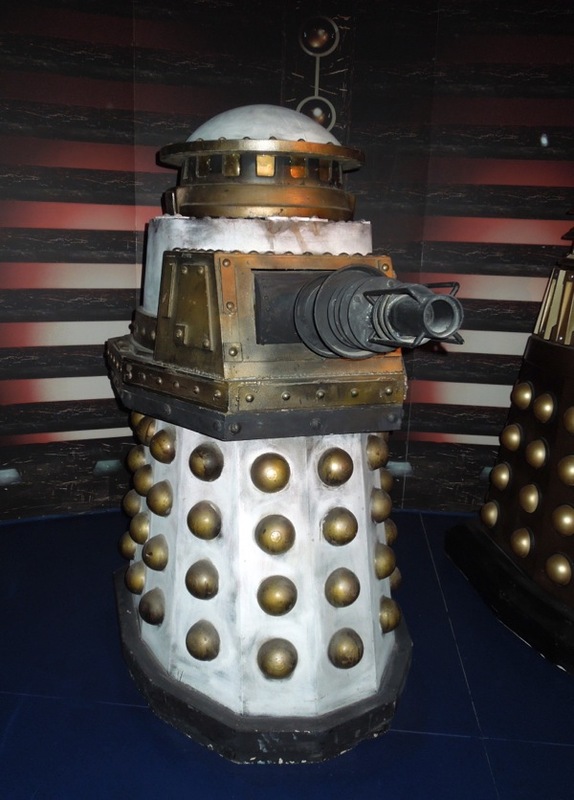 Starring Sylvester McCoy as the Seventh Doctor, this Special Weapons version (a refurbished original) was the deciding factor for the Imperial Dalek Faction in their war against their renegade compatriots. 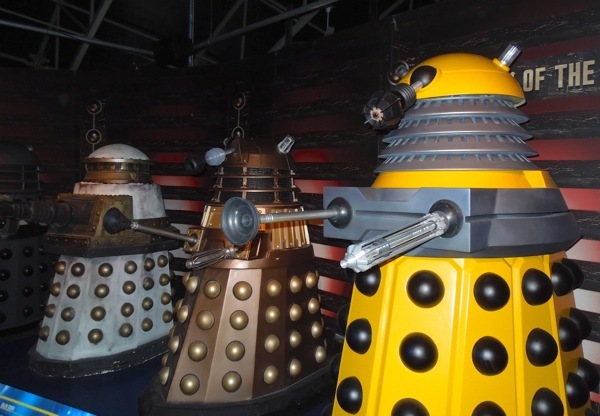 Flash forward to the 2005 revival of Doctor Who under the guiding hand of Russell T. Davis and we discover that the Daleks who were designed to wipe out all non-Dalek life have seemingly perished in the Last Great Time War, along with the Doctor's fellow race of Time Lords. 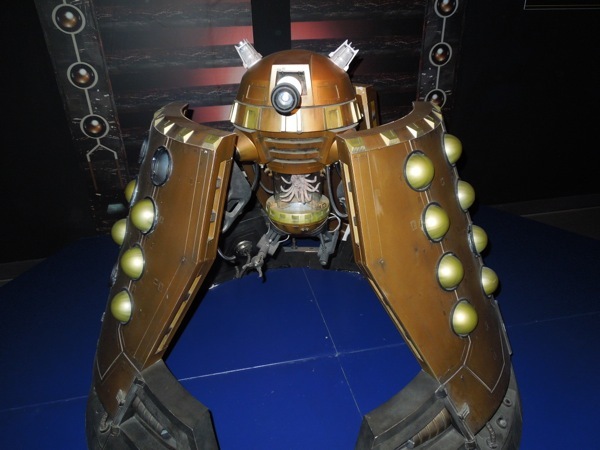 In fact, a single Dalek returned in the episode of the same name, the sixth episode in the first season which saw Christopher Eccleston headline as the Ninth Doctor. 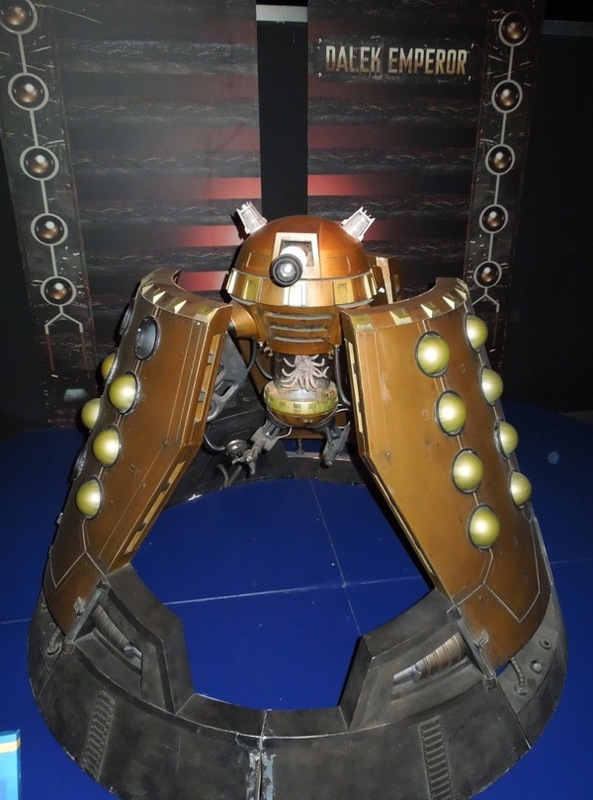 This Dalek or 'Metaltron' was a prized artifact in the underground facility housing rare alien treasures of a private collector in Salt Lake City, Utah in the year 2012. Taking pity on the creature, the Doctor's companion 'Rose' unwittingly reactivates the exterminating monster when her human DNA and time energies from the TARDIS re-energises it. By the end of the episode, conflicted by absorbing Rose's DNA it activates its self-destruct and implodes. 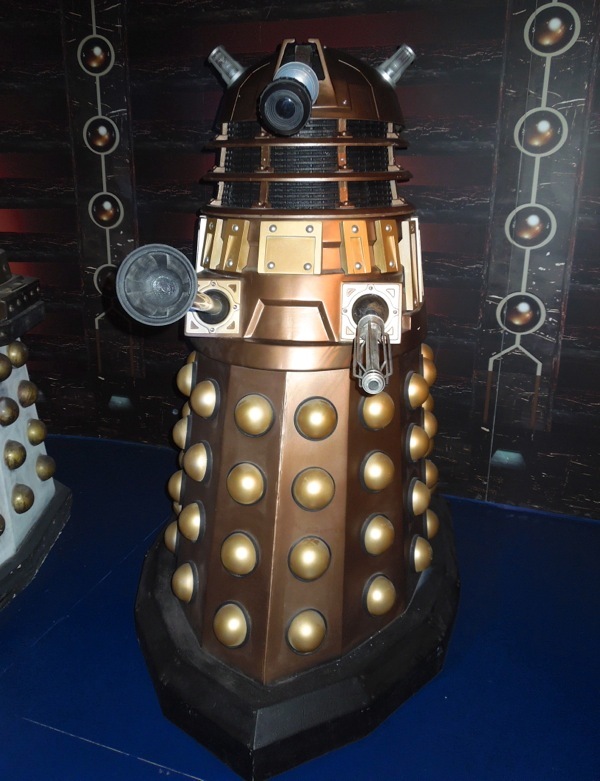 The Daleks returned in full force to plague the Ninth Doctor in 2005's final two episodes of the first revival season, including the 'Dalek Emperor' in the season finale, The Parting of the Ways. 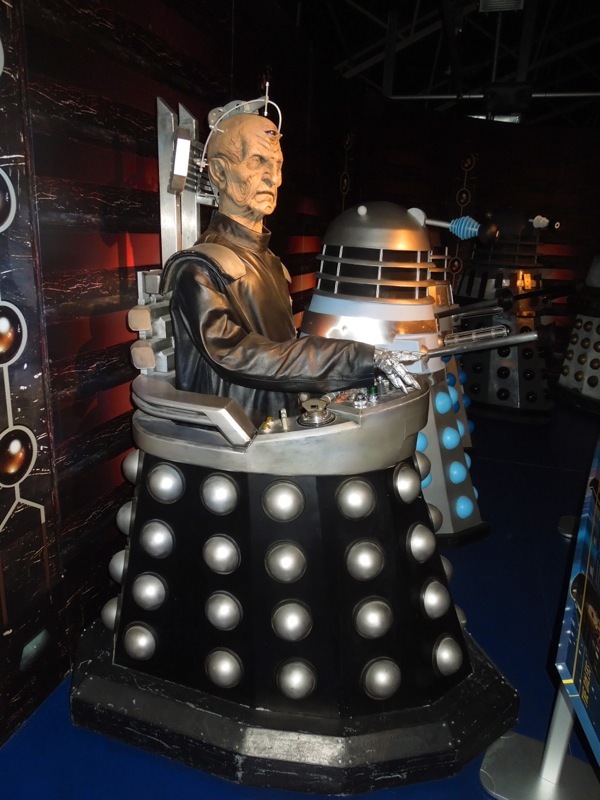 Apparently the Emperor had survived the Time War and had been clandestinely rebuilding his Dalek army using human DNA and is now revered as their God. 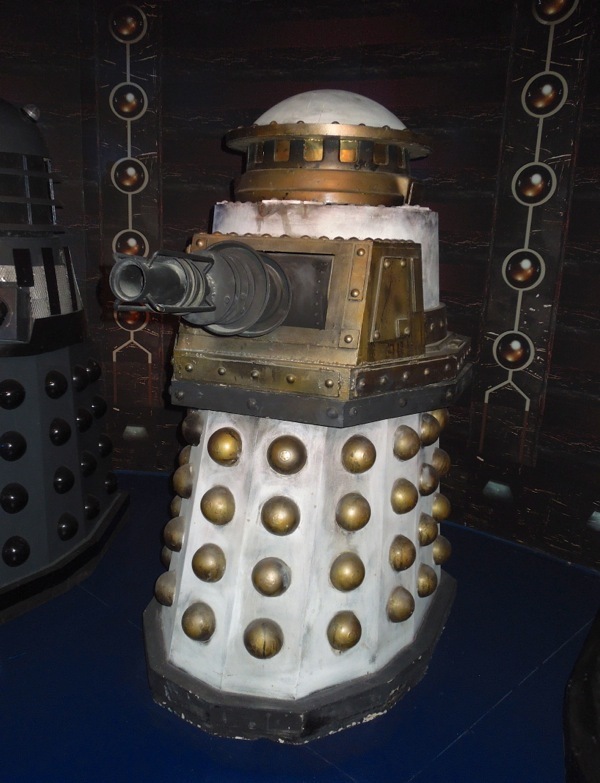 Through the wonders of CGI and green-screen effects this original scale model of the Emperor was seen in the show as a towering, enormous Dalek shell. 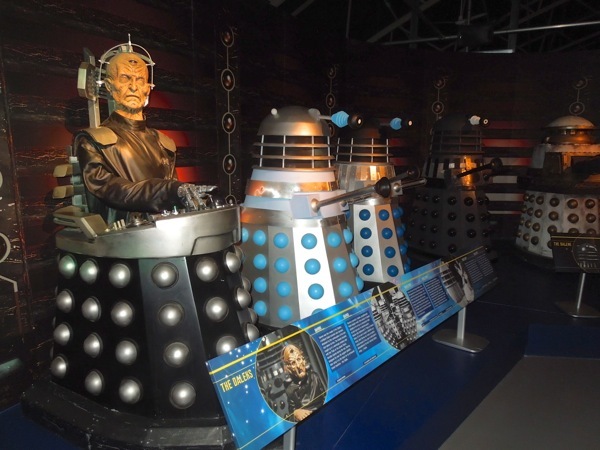 And finally, in the fifth season episode Victory of the Daleks, starring Matt Smith's Eleventh Doctor, the Time Lord, Amy and 'Winston Churchill' faced off against Daleks in London's past, during World War II's Blitz. 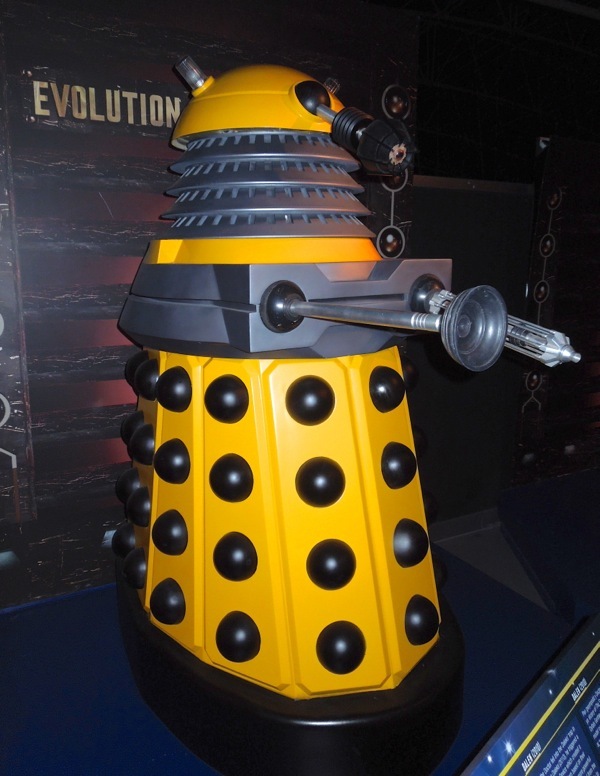 The episode introduces a new bigger and more powerful Dalek Paradigm, based on their original pure DNA. 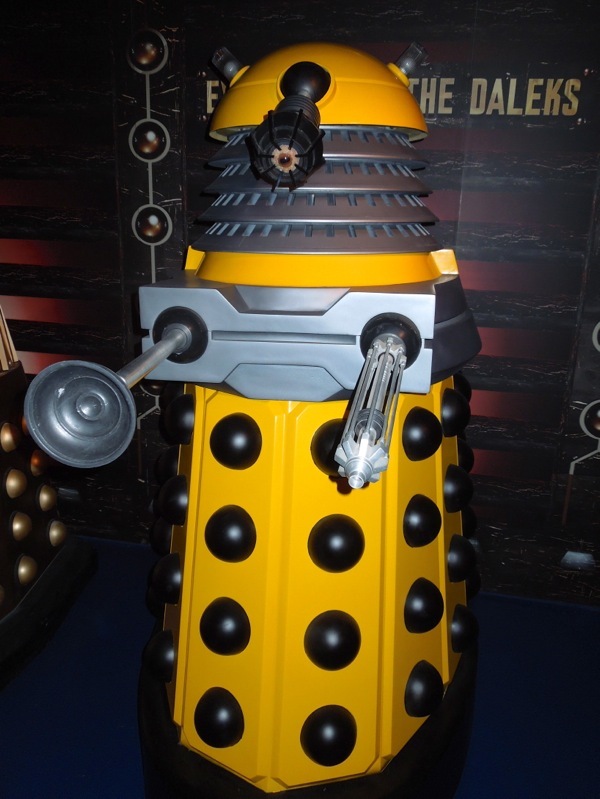 Redesigned by episode writer Mark Gatiss, these Daleks also who come in an array of bold and vibrant new colours, like these yellow ones. 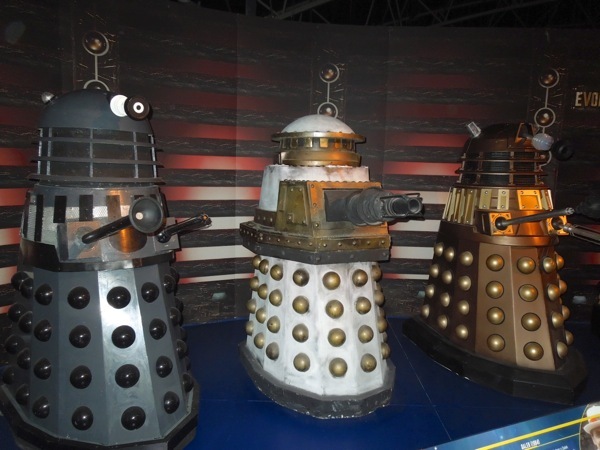 As you can see the Doctor Who Experience was worth the visit just to see these monstrous beauties. 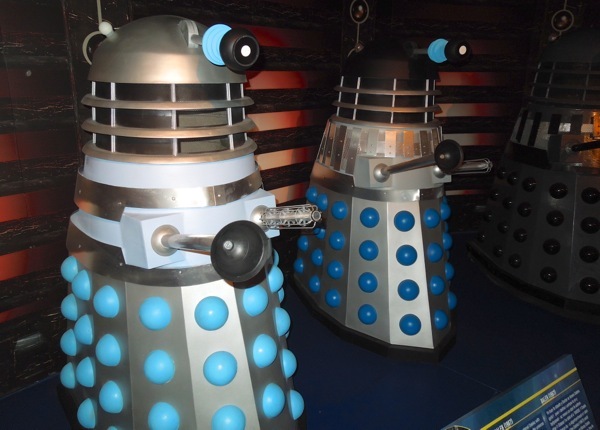 Hands up who wants a Dalek of their own. 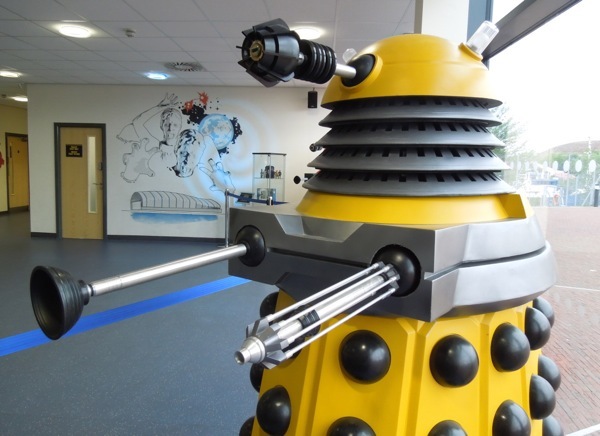 If you're a fellow Whovian, be sure to enjoy these other Doctor Who props and costumes featured here at Hollywood Movie Costumes and Props and stay tuned for more to materialise soon.